Cindy Armentrout, Esq. has been practicing law for nearly ten years and specializes in tax planning, asset protection, and wills. Cindy kindly provided this primer on how the step-up in basis works for surviving spouses, including ways that they can receive the full stepped-up amount even if they live in a non-community property state. Visit ArmentroutAndAssociates.com for more information about Cindy’s firm. Estate planning the right way can save you and your heirs money and hassle. There is a lot to know and consider when planning your estate. Tax considerations are always a concern. So, when speaking of step-up in basis, we need to look at it from so many different perspectives: individuals, married couples, trusts, trusts with A/B splits, community property jurisdictions, and separate property jurisdictions. Let’s start with the rule. Code §1014(a) provides that the basis of property in the hands of a person acquiring the property from a decedent (someone who has passed away) is the fair market value of the property at the date of the decedent’s death (or alternate valuation date). Basically, when you die, assets (qualified stocks, real estate, etc.) that you leave to your heirs get their original cost basis wiped out entirely. Your heirs get to pretend like they bought the stock or property at the fair market value on the date they inherited the asset. This is known as the “step-up in basis” rule. If an individual (non-married person) dies, the assets he/she leaves to his/her heirs/beneficiaries get a full step-up in basis. For a married couple in a community property jurisdiction, it works the same. A spouse passes away, and since all assets are considered part of the community (not technically owned by either spouse), the entire estate (the community) gets stepped up. The surviving spouse now has new basis on the entire estate. When the surviving spouse passes away, there is a second “step-up” in basis that occurs since Code §1014(a) will kick in again — thus, the beneficiaries will get a new basis as of the date of the surviving spouse’s death. This is known as the “double step-up in basis” rule. If a married couple is in a separate property jurisdiction, this gets trickier. In a separate property jurisdiction, each spouse owns his or her own assets. Even if the property was jointly owned between spouses, they each own their own half. Thus, upon one spouse’s death, Code §1014(a) only applies to that portion — meaning only one-half of the property would receive such an adjustment in basis. To complicate things further, there is one exception to the step-up rule. What does this mean? Assume a wife transfers a depreciable asset to her husband. The asset is worth $5 million and has a tax basis of $1 million. The husband unexpectedly dies within a year of the gift and under the terms of his will the asset passes directly back to the wife, who needs the asset to support her lifestyle. Normally, at the husband’s passing, the asset would receive a step-up in basis to its fair market value of $5 million. However, in this case, upon the passage of the asset back to the wife, section 1014(e)(1) eliminates the step-up and $4.0 million of additional basis is lost. How do you fix this? You can create joint trusts in Community Property Jurisdictions. Nevada is one of those jurisdictions – but you must have a Nevada trustee (just like Alaska) which will cost annually at a rate that is usually dependent on the amount of assets held by the Nevada or Alaska Trust. Thus, this technique is usually reserved for larger net worth clients who have enough wealth and enough of a tax problem to justify the ongoing costs. For those types of clients, however, this works perfectly. Nevada also has some advantages in this area as well regarding the asset protection you get with this type of trust. What if you live in a separate property jurisdiction but you purchase property in a community property state? The rule is, if you purchase with your separate property assets, it will retain its separate property character and be subject to all the rules above, unless a Nevada or Alaska Community Property Trust is used. However, if you purchase it with community property assets (you complete a joint purchase) then the property will be subject to community property laws in that jurisdiction. Why is this important? If the property is purchased as community property, it will receive “double step-up” in basis treatment as described above, regardless of the fact that you live in a separate property jurisdiction. What if you are in a community property jurisdiction and have assets in a joint Revocable Living Trust (RLT)? 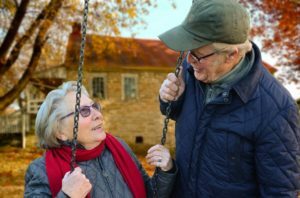 If you live in a community property jurisdiction and have assets in a joint RLT, you get the double step-up basis, so long as assets pass freely to each spouse and then beneficiaries. This differs for separate property jurisdiction with assets in an RLT. Sometimes a technique called an “A/B split” is used within an RLT for asset protection reasons and certainty of distribution reasons (this is actually great planning). If this technique is used, it is important to make sure proper language is included to be certain that, at the second spouse’s death, you get a second step-up in basis. If the trust is drafted incorrectly, you could be missing out on the second step-up in basis. As you can imagine, this could have significant tax consequences. Talk with your estate planning attorney to be sure you are maximizing asset protection and taxes and that your assets are passing to beneficiaries in an appropriate manner.